Mandela Has Made 'Remarkable Progress,' Daughter Says : The Two-Way The anti-apartheid champion and former South African president may soon be sent home from the hospital where he's been since June 8, Zindzi Mandela tells Sky News. That word comes on the eve of Nelson Mandela's 95th birthday. 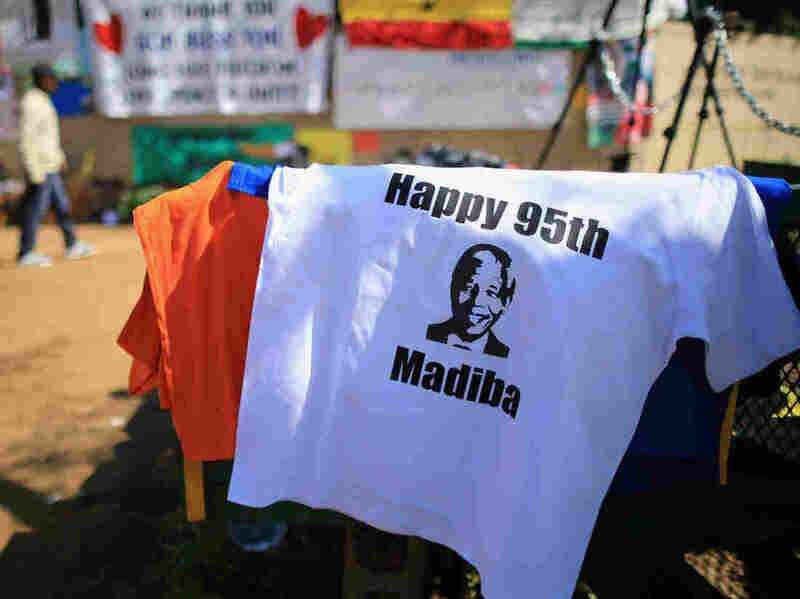 On the eve of Nelson Mandela's 95th birthday, street vendors in Pretoria, South Africa, were selling T-shirts to mark the occasion. Madiba is Mandela's tribal name. Nelson Mandela is making "remarkable progress" and could be released from a Pretoria hospital soon, his daughter tells Sky News on the eve of the anti-apartheid icon's 95th birthday. Zindzi Mandela, 52, also says her father is communicating with his eyes and hands, watching television and that "you can see he is there in his eyes; the same energy and strength." The elder Mandela, who spent 27 behind bars as a political prisoner during the long battle against South Africa's apartheid system, went on to become president in 1994 after his nation's first democratic elections. Mandela has been in a hospital since June 8 for treatment of a life-threatening respiratory infection. On Thursday, his birthday is being celebrated as Nelson Mandela Day in South Africa. Earlier on Wednesday, The Daily Telegraph reported that a granddaughter — Ndileka Mandela — says her grandfather's condition is "stable." It added that on Nelson Mandela Day his family will, "like many South Africans and people around the world ... spend 67 minutes undertaking charity work ... in recognition of the 67 years South Africa's first black, democratic president spent in public service."